Types of Robots: A single gripper robot can hold only one part at a time. Cell Layout: The layout refers to the arrangement of machines within the cell. Most robotic cell models assume one of two layouts: linear or circular. Number of Part-Types: A cell producing identical parts is referred to as a single-part-type cell. In contrast, a multiple-part-type cell processes lots that contain different types of parts. Generally, these different part types require different processing times. Processing Times: Since each of the stages performs a different function, each, in general, has a different processing time. Loading and Unloading Times: The time required for loading and unloading is another factor that influences the processing. Whenever it comes to the use of sophisticated and complicated technology like robot system, safety comes first. It is estimated that between 20 and 50% of the cost of a robot installation is attributable to safety-related issues, so robot cell design is an important factor that contributes to the safety of the integration system. One of the most important features of the robot cell design and its programming is the safety. Robot cell design is a layout or planning to have fully functioning integration process. 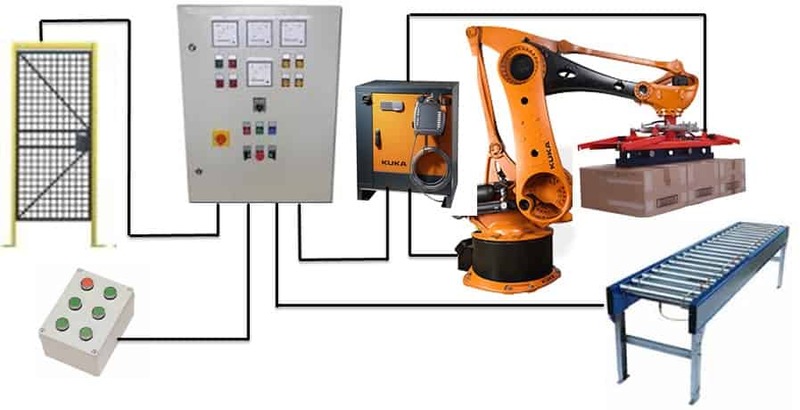 An industrial robot work cell is a workstation which consists of at least one robot and its controller along with the safety measures. Generally, robot cell design comes in two cell types: steel and aluminium. Aluminium is lightweight and it is easy to modify or extend with no need for welding or painting. Steel has a rugged appearance and it is used for heavy works, for example, the metals processing industries. Phoenix is in the position of offering both types. You can choose from any of those cells that seem suitable for your work. Our experts can help you in the selection process if you have some confusion in your mind.